Apparently the only two films worth seeing in cinemas these past couple of weeks have been both Jurassic World (review is here), and Inside Out, Pixar’s latest animated flick, and their first original film in three years. I use to really love seeing all the Pixar films up until Toy Story 3, and they were always films that I looked forward to seeing, as well as films that I looked forward to putting on my best-of list at the end of the respected years. That all changed when Pixar put out the cynical cashgrab that was Cars 2 in 2011, and I haven’t seen a Pixar film since. I decided to go see Inside Out because the concept seems so damn fascinating, there’s a terrific team behind the film (Pete Doctor, director of Monster’s Inc. and Up, is at the helm), and an impressive voice cast with comedians such as Amy Poehler, Lewis Black, Mindy Kaling, Bill Hader, Phyllis Smith, and Bill Hader as the voices of emotions inside the head of Riley. I hear this film is pretty spectacular, and you’re not gonna hear anything that differs from those expectations in this review. 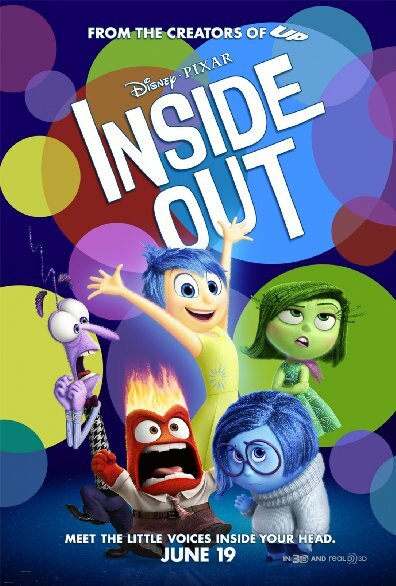 Inside Out takes place inside the mind of an 11 year-old girl named Riley. Riley and her family are moving from Minnesota to San Francisco, which puts a bit of a damper on everything. There are five emotions that run her head, there’s Joy (Poehler), Sadness (Smith), Fear (Hader), Anger (Black), and Disgust (Kaling). One day, Sadness accidentially messes with one of Riley’s core memories inside of her head, which sends everything into a spiral, as Joy and Sadness are sent outside of the headquarters of her head and are sent to the dark depths of Riley’s head. They must work together to get themselves back to headquarters before Riley’s life and emotions come crashing down. I really got excited for the film from its first couple of trailers. They didn’t feel as lame or forced as the trailers for the last couple of Pixar films, in fact, the trailer was funny, beautiful, and had potential for some truly moving moments. To my surprise, that was exactly what Inside Out was, and so much more. Arguably the best written film of the year by far, the film is full of clever visual gags and gut-busting moments of hilarity. There were moments were I was genuinely laughing throughout the film, and not just chuckle or do a courtesy laugh (because that’s what film critics do?). Every character inside of Riley’s head is cast perfectly, and each comedian that voices said emotion fits and works. Lewis Black steals damn near every scene he’s in as Anger, and Amy Poehler has some of the more emotional beats of the film (Granted, she also has some terrifically funny moments, as do all of the emotions). They showed this in the trailer, but at times the film cuts to the inside of other humans’ heads, to see how their headquarters operates, and they are honestly some of the funniest moments I’ve seen on screen in quite some time. But what I really loved is how emotional the film got at times, and I was sweltering away in tears toward the end (which felt weird since my buddy and I were the only audience members without kids in the theater). There are some genuinely beautiful and moving moments in this film, so good luck holding back the tears during this one. That’s all I got one the film, no complaints, honestly just a flawless animated film that might as well be the finest film of 2015 to date. If you haven’t seen Inside Out yet (judging by the box office, a lot of you already have) then do yourself a favor and go check this one out. That’s all. Go enjoy your Independence Day this weekend.